Radionuclide functional imaging has become a central part of pediatric oncological practice. 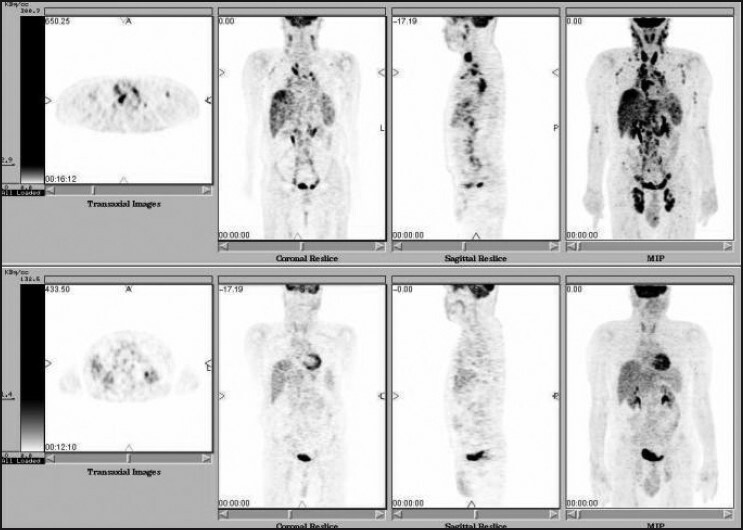 There have been a number of major advances in imaging technology in recent years, but multislice CT with PET is the modality generating most interest in cancer imaging. In this review, we discuss the common uses and specific issues with regard to PET-CT imaging in pediatric practice. Brain tumors form a significant percentage of pediatric oncology. Use of FDG-PET in brain tumors has helped distinguish viable, residual, or recurrent tumor from post-therapeutic changes and necrosis. High-grade tumors show high uptake of FDG at diagnosis. FDG-PET results may also not accurately correlate with tumor progression after intensive radiation therapy. FDG-PET has been applied to accurate biopsy of infiltrative tumors, tumor grading, and prognostication. Limited available data also suggest that FDG-PET findings correlate well with histopathology and clinical outcome in children. FDG uptake is generally greater in higher grade lymphomas than in lower grade lymphomas. FDG-PET reveals disease sites that are not detected by conventional staging methods, resulting in upstaging of disease with potential therapeutic review. FDG-PET is useful for assessing need for marrow biopsy, residual or recurrent soft tissue masses seen on CT after therapy. The primary role of FDG-PET in neuroblastoma is in non-MIBG concentrating tumors. [11C]-Hydroxyephedrine ([11C]-HED), an analogue of norepinephrine, and [11C]-epinephrine PET have also been used in evaluating neuroblastoma. 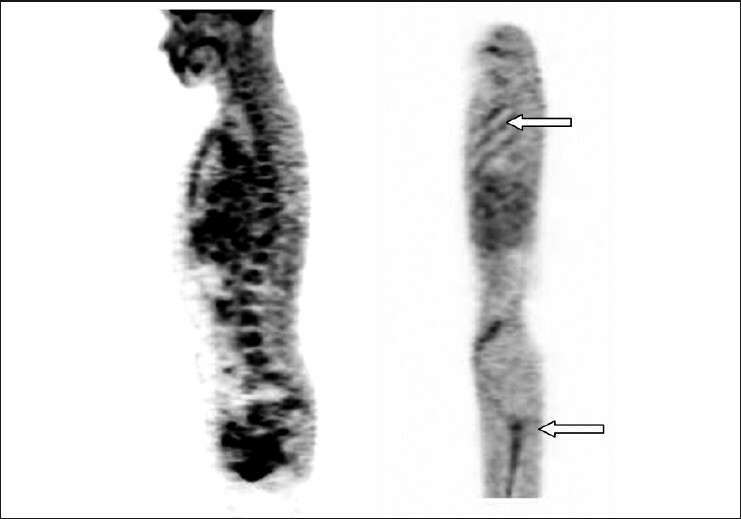 Uptake of these tracers is demonstrated within minutes after tracer administration, an advantage over MIBG imaging. The exact roles of FDG-PET in osteosarcoma and Ewing's sarcoma are not definitive. FDG-PET may play an important role in monitoring response to therapy Another diagnostic role may be in assessing patients with suspected metastatic disease. Bone marrow biopsy (BMB) is currently the standard method to evaluate marrow involvement in malignant lymphomas. However, there exist a number of pitfalls in this technique that can have important implications for initial staging, prognostification, and treatment of the disease. The present study was undertaken to investigate the utility of FDG-PET imaging in the detection of bone marrow involvement in untreated lymphoma patients. Forty untreated patients (36 males and 12 females) with either Hodgkin's disease (HD) (n = 17) or non-Hodgkin's lymphoma (NHL) (n = 31) underwent whole body FDG-PET study for disease evaluation. Bone marrow uptake of FDG was graded as absence or presence of disease activity at marrow sites by qualitative assessment. Semiquantitative analysis involved deriving disease metabolic index (DMI) using the following formula: DMI = SUV max of suitable circular ROI over PSIS or trochanteric region/ SUVmax of similar ROI over adjoining background. Findings of BMB and FDG-PET were compared for final analysis. Eleven out of 17 HD patients (12 males and 5 females) demonstrated concordance between FDG PET findings and BMB reports. Remaining 6 cases showed discordance of FDG-PET demonstrating presence of marrow involvement at marrow sites and uninvolved marrow on BMB. Twenty six of the 31 NHL cases (24 males and 7 females) demonstrated concordance between FDG PET findings and BMB reports. Remaining 5 cases showed discordance of FDG-PET demonstrating presence of marrow involvement at marrow sites and uninvolved marrow on BMB. All the BMB positive patients (2 of HD and 5 of NHL) demonstrated disease activity in bone marrow on FDG-PET study. All patients with absence of disease activity at marrow sites on FDG-PET scan (9 of HD and 21 of NHL) had histology proven uninvolved marrow. The quantitative assessment by DMI showed a mean of >2.5 in HD and NHL patients at the PSIS region and the trochanteric region bilaterally in cases of bone marrow involvement by the disease. 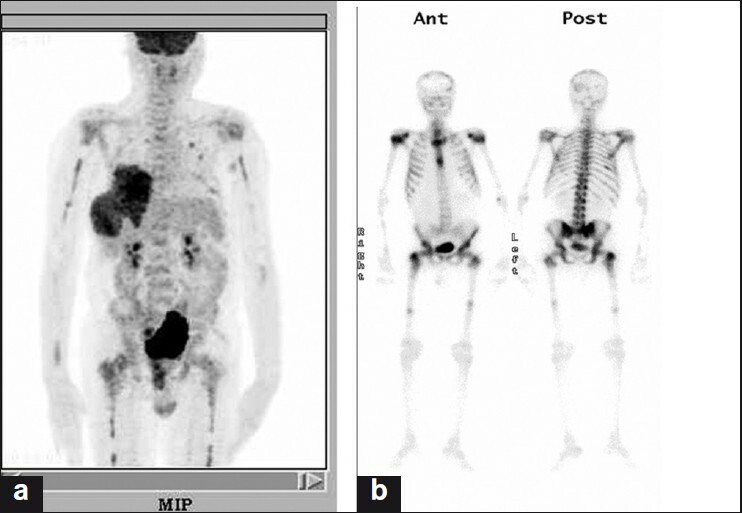 FDG-PET is a useful adjuvant to BMB for the evaluation of bone marrow involvement in lymphoma patients. The disease metabolic index of >2.5 at the marrow sites can serve as a semiquantitative parameter for such diagnosis on FDG-PET in untreated patients of lymphoma. Prostate cancer is one of the most common malignancies of elderly males. Management depends on the accurate estimation of disease both at initial diagnosis and in its subsequent course. In the present study, we evaluated the diagnostic utility of positron emission tomography with 18 F-fluorodeoxyglucose (FDG-PET) in patients having prostate cancer. The findings were compared with the results of bone scan (BS) for the detection of bone metastases. Sixteen patients (age range, 55-83 years) with confirmed diagnosis of prostate cancer were included in the prospective study. Three patients had undergone bilateral orchidectomy, 1 had hormonal therapy, 9 had undergone both, and 3 had no therapy. All the patients underwent wholebody BS and FDG-PET within 1 week. Interpretation of BS and FDG-PET were performed qualitatively. 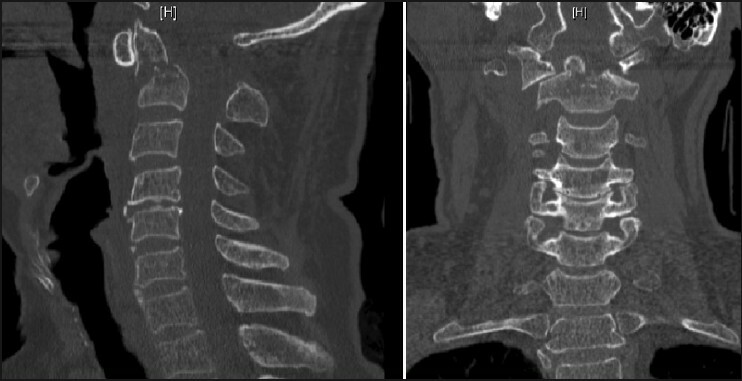 Osseous abnormalities detected by both methods were compared. Involvement of the disease in other sites as seen on FDG-PET was also noted. BS detected 197 osseous lesions, whereas FDG-PET could detect 97 (49%) bone lesions. However, in 3 patients without any prior therapeutic intervention, FDG-PET results were superior or equivalent to that of BS. FDG-PET also detected extensive involvement of the disease in the bone marrow in 4 patients, lymph node metastases at various sites in 8, liver metastases in 2, and lung metastases in 1 patient. 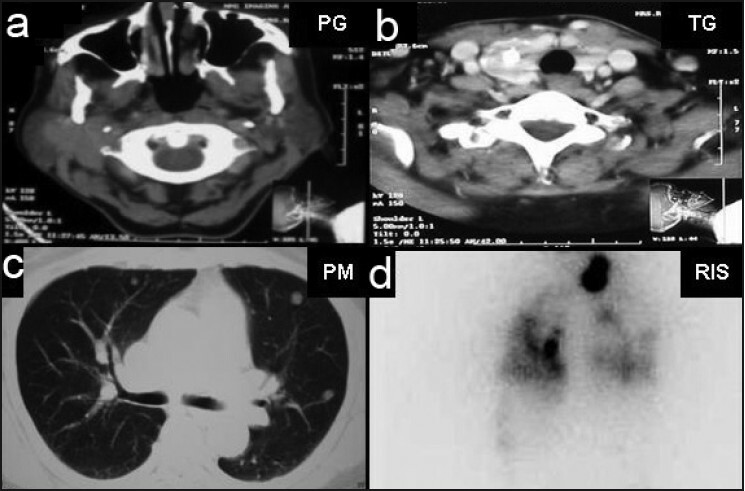 FDG-PET could demonstrate less number of osseous metastases in comparison with BSs, but the results have to be interpreted in the background of prior treatment administered and the tumor biology of the lesion. It is evident that FDG-PET could detect the unknown soft tissue involvement of the disease with good sensitivity, which might play an important role in the management of prostate cancer. Overall, in the absence of novel PET tracers, both skeletal scintigraphy and FDG-PET imaging can play a complimentary role in the management of prostate cancer. Background: Patients with cancer are predisposed to infections. Antimicrobial patterns and antibiotic sensitivity change with increasing age, making choice of empirical therapy more complicated. Materials and Methods: This single-center study aims to try and assess the influence of age on microbiology and antibiotic sensitivity of organisms causing infection in patients with malignant disease. Results : The five most common bacterial pathogens isolated were Pseudomonas sp (245, 26.2%) > Enterocococcus sp (109, 11.66%) > Staphylococcus aureus (107, 11.44%) > Escherichia coli (106, 11.34%) > Klebsiella sp (99, 10.59%). There was no significant change in the distribution of Gram-positive and Gram-negative bacteria with age. However, there was an increase in the occurrence of the Enterobacteriacea group and a decrease in infections caused by nonlactose fermenters with increasing age. The ESBL production increased from 10.52% (12-19 years) to 24.88% (>50 years) as did oxacillin resistance (from 14.3% to 28.1%) among S. aureus isolates. The activity of most antimicrobial agents decreased with increasing age. The decreasing trend of activity was statistically significant for meropenam (73.3-41.2%) against Pseudomonas sp. and for the activity of the aminoglycosides for Acinetobacter sp (61.1-17.4% for amikacin). Conclusions : This suggests that empirical antibiotic therapy needs to be changed on the basis of the age of the patient. It also appears that combination therapy is essential for the empirical treatment of infections in elderly patients with cancer. Background: Fanconi anemia (FA) is an autosomal recessive, cancer susceptibility disorder characterized by diverse clinical features, such as short stature, skeletal or skin abnormalities, progressive bone marrow (BM) failure, and increased risk of malignancies. Clonal chromosomal abnormalities are frequently reported in FA patients transformed to myelodysplastic syndrome (MDS) and acute myeloid leukemia (AML). Aim: To study the incidence of malignancy and clonal chromosomal abnormalities in FA patients. Materials and Methods: Thirty-eight clinically diagnosed FA patients were studied at the time of diagnosis and the patients were followed-up for a maximum of 28 months at 3-month intervals. The median duration of follow-up of these patients was 19.8 months. Chromosomal breakage investigation using mitomycin C (MMC)- and diepoxybutane (DEB)-induced peripheral blood cultures were stimulated with phytohemagglutinin. Cytogenetic study was done on the BM cells to detect clonal chromosomal aberrations. Results: Eleven (28.95%) out of 38 patients developed malignancies, including 6 (54.54%) MDS, 4 (36.36%) AML, and 1 (2.63%) squamous cell carcinoma. The clonal chromosomal abnormalities were detected in 5 (45.45%) FA patients who developed malignancies and the type of chromosomal abnormality detected were monosomies 5, 7, trisomy 10, dup(1)(q12-q24), and inv(7)(p11pter). Conclusion: The FA patients have a high risk of developing malignancies, and clonal chromosomal abnormalities play an important role in the prognosis of the disease. Therefore, FA patients need to be followed-up at regular intervals for early diagnosis and optimal management of the disease. Objective : To evaluate the safety, feasibility, and outcome following radical excision of thymoma with resection and reconstruction of invaded mediastinal vessels. Study Design : A retrospective study. Patients and Methods : Six patients with thymoma invading the superior vena cava (SVC) and/or the brachiocephalic veins (BCVs) were reviewed in this study. All the patients underwent radical excision of the tumor along with invaded mediastinal vessels followed by vessel reconstruction or repair. The clinical presentation, operative details, postoperative course, and follow-up were reviewed and analyzed. Results : Three patients presented with features suggestive of SVC syndrome. 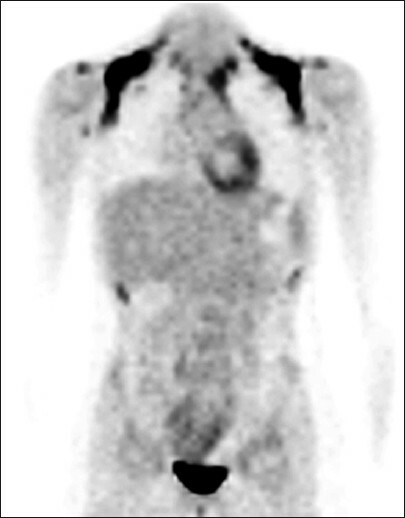 Contrast-enhanced computed tomography of the chest was the primary imaging modality, which detected a tumor with invasion of major mediastinal veins. 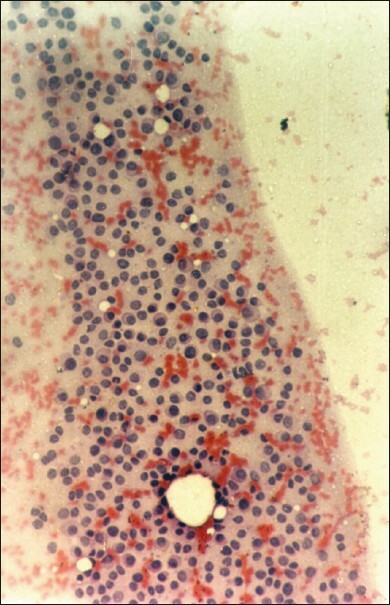 WHO type B2 was the commonest histologic type, which was seen in 4 cases. Intraoperatively, SVC invasion, SVC and BCV invasion, and BCV invasions alone were seen in 1, 2, and 3 cases, respectively. The vessels were reconstructed with a prosthetic graft in 3 patients, and autologous pericardial tube graft was used in 1 patient. Two patients had primary repair of the wall of the involved vessel. Postoperative course was complicated by ventilator support requirement in 2, graft thrombosis in 2, acute renal failure in 1 and pneumonia in 1 patient. All patients are alive at the end of follow-up period ranging between 18 and 24 months. Conclusion: Thymoma excision with the reconstruction of SVC or BCV is safe and feasible in experienced hands. Context: Prediction of metastases of oral squamous cell carcinoma (OSCC) using incisional biopsy. Aims: To assess the efficacy of nuclear morphometry in predicting the nodal metastases of OSCC and to compare manual and computer-based image analyses. 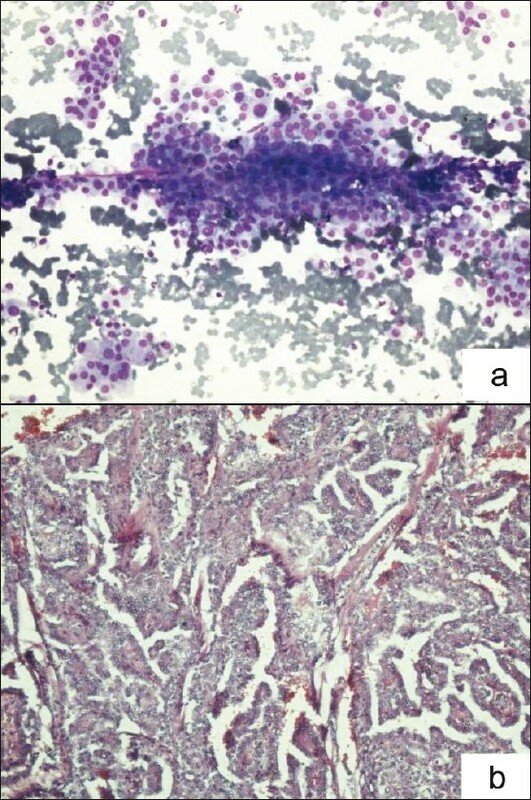 Materials and Methods: Sixteen cases of moderately differentiated squamous cell carcinoma (8 with metastasized lymph nodes and 8 node-negative cases) were examined using manual and computer-based image analyses. Nuclear area, perimeter, circular rate, larger to shorter axis ratio, and coefficient of variance of nuclear area (NACV) were calculated from 100 nuclei of the processed incisional biopsy specimen. Statistical Analysis: The parameters were compared between the node positive and negative cases using Student's t test and with the level of lymph node involved using ANOVA test and Bonferroni's post hoc assessment. Manual and computer-based image analyses were compared by Spearman's correlation. Results: A significant variation between the node positive and negative groups was observed with respect to circular rate (P = 0.031) and NACV (P = 0.036). The nuclear area (P = 0.009), perimeter (P = 0.0001), circularity (P = 0.045), and larger to shorter diameter ratio (LS ratio) (P =0.02) were significantly different in the levels of the nodes involved. There was good a correlation between manual and computer-based analyses (Spearman's rho, 0.616-0.824) in nuclear size parameters and the circular rate had a negative correlation (-0.118, P = 0.664). 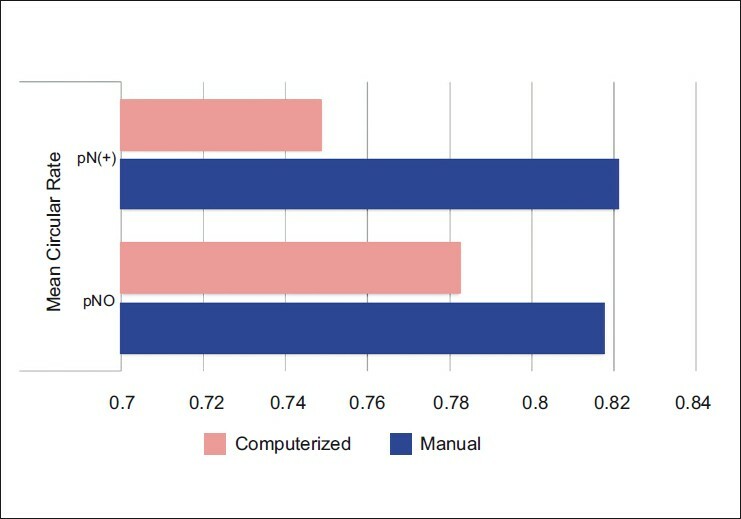 Nuclear circularity was better assessed by computer-based analysis. Conclusion: Preoperative morphometric assessment of the nuclear features may detect early cellular changes and thus, are useful in predicting nodal metastases in OSCC. Background: Proteins encoded by FAS, BCL-2 and TP53 genes are major regulators of cellular survival and apoptosis. Results of recent investigations show remarkable biological features of these factors, which propose their role in the course of cancer. Therefore, it is plausible to test whether transcripts of these genes could be detected in the peripheral blood cells of patients with breast cancer. 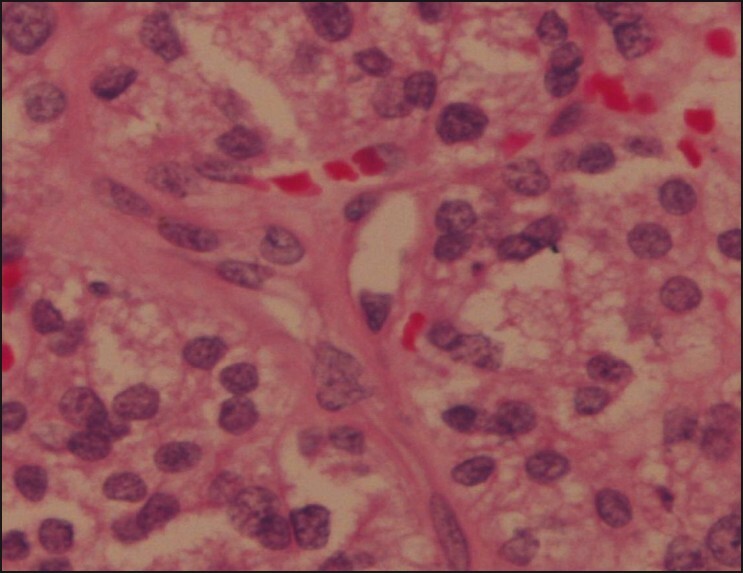 Materials and Methods: Real-time polymerase chain reaction assay was performed to detect FAS, BCL-2, and TP53 gene transcripts in the peripheral blood samples of 50 women with histologically confirmed infiltrative ductal carcinoma of the breast. Gene expression of patients was compared with 40 healthy women without history of malignancies or autoimmune disorders. Results: The relative overexpression of BCL-2 in the blood cells from patients of early stages (I and II), nonmetastatic and low-grade tumors compared with healthy individuals, was shown by measuring the gene transcript. Similarly, 3-4-fold higher expression of FAS was found in those patients. The measurement of TP53 transcripts also showed higher levels of gene expression in patients compared with healthy controls. BCL-2 gene expression showed a significant correlation with FAS, while such a correlation was not observed between BCL-2 and TP53 . Conclusion: It seems tumor cells overexpress BCL-2 to inhibit apoptosis and guarantee their cell survival. As a physiologic response, FAS and TP53 could be upregulated to suppress tumors. However, these pathways at early stages of disease may be inadequate and cause progressive malignancy. 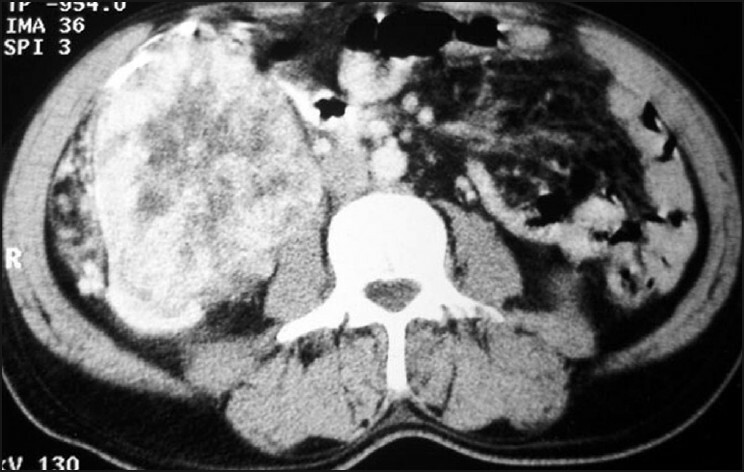 Aims: Inverted papilloma (IP) is an uncommon benign neoplasm of the urinary tract. 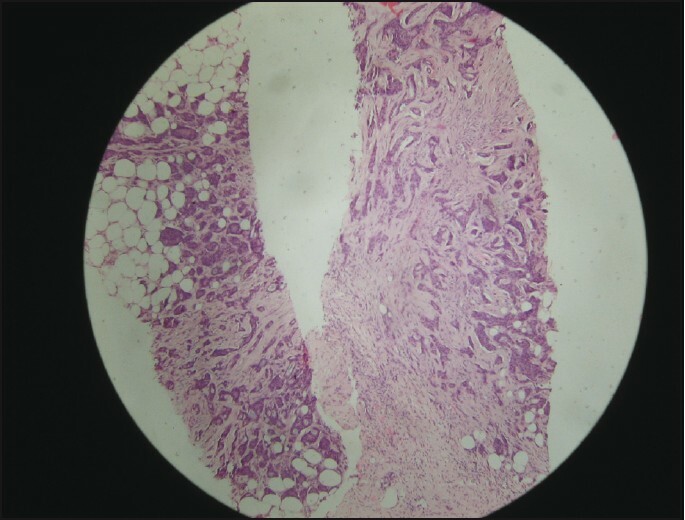 Its multiplicity, recurrence, and association with transitional cell carcinoma (TCC) leads to conflicting clinical conclusions regarding its biological behavior, and hence, the need for rigorous follow-up protocols. In this study, we review all cases of urinary bladder IP in our institution and determine the need for strict follow-up. 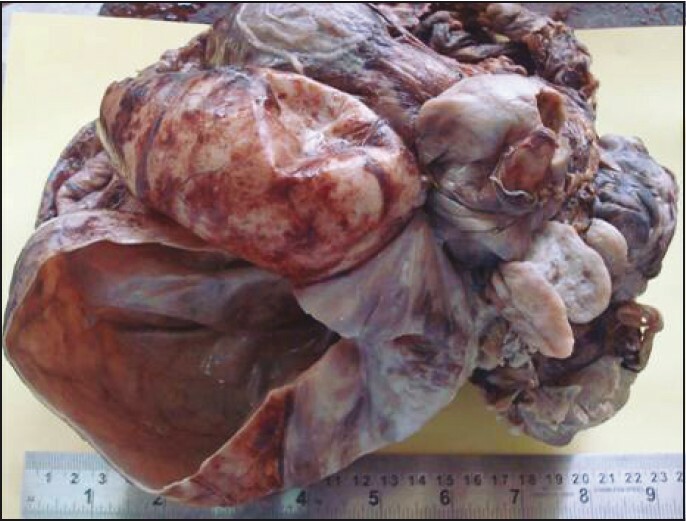 Materials and Methods :0 We included consecutive patients from August 2004 to August 2008 with IP of the urinary bladder in this study who did not have prior or concurrent urothelial carcinoma. A single pathologist performed the histologic review. The patients had undergone strict a follow-up schedule every 6 months. Results: In our study of the 24 patients, the mean age at presentation was 53.5 (range 22-81) years. The mean follow-up period was 25.8 months (range 6-58 months). Of the 24 patients, 21 were men and 3 were women. No patient had a synchronous or previous bladder tumor. The most common presenting symptoms were macroscopic hematuria and dysuria. All were solitary tumors except one, most commonly found at the bladder neck and trigone. The average follow-up period was 2.5 years without any evidence of recurrence. Conclusions: We conclude that when diagnosed by strictly defined criteria, IP as benign urothelial neoplasm was with extremely low incidence of recurrence and good prognosis. It does not seem to be a risk factor for TCC, especially if located in the bladder. Therefore, a good transurethral resection is adequate therapy and follow-up protocol as rigorous as those for TCC may not be necessary. Context: Adenoid cystic carcinoma (ACC) is a rare neoplasm that usually arises from the salivary, lacrimal, or other exocrine glands. It is characteristically locally infiltrative in nature and has a tendency toward local recurrence, high propensity for perineural invasion, and prolonged clinical course. Aim: To analyze the presentation and natural history of cases of adenoid cystic tumors of salivary glands in our institution; and to compare with the existing literature. Design and Setting: Retrospective study at the Department of Radiotherapy. 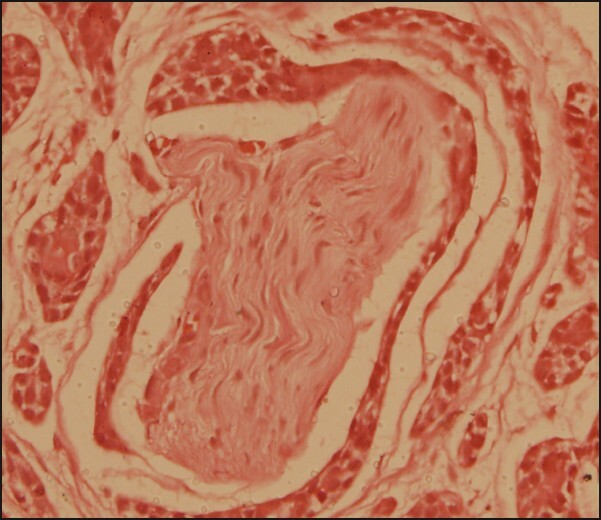 Materials and Methods: Data on 18 patients of ACC of the salivary glands treated between 2004 and 2008 were reviewed with respect to clinical presentation, stage, and histology. Results: There were 8 cases of major salivary gland tumors (47%), of which 2 were in the submandibular and 6 were involving the parotid. Ten patients (53%) had minor salivary gland involvement. Two patients had metastasis at the time of presentation. All patients underwent surgery. 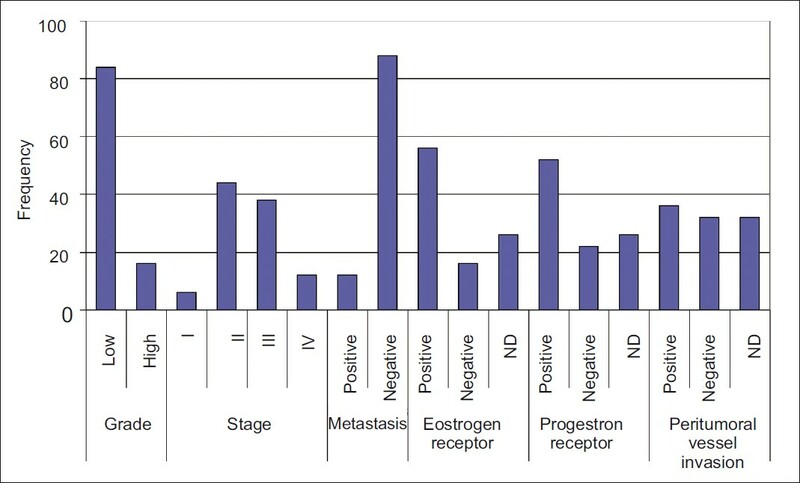 Radiotherapy was delivered to 16 patients and chemotherapy to 6 patients (concurrent, n = 3 and adjuvant, n = 3) and no adjuvant therapy was given to 2 patients. All patients were alive at a median follow-up of 3 years. No patient developed local or distant failure during the study duration. Conclusion: ACC has locally aggressive behavior. Radiotherapy adjuvant to surgery improves local control in locally advanced disease. Longer follow-up is mandatory in view of incidence of late metastasis. Background: Use of antimicrobials (AM) and granulocyte colony stimulating factors (G-CSF) affect the outcome and cost of treatment of febrile neutropenia (FN). There are no studies describing the AM utilization pattern or the use of G-CSF and cost incurred on them in cancer patients with FN from India. 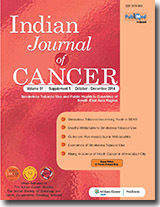 Materials and Methods: A study was conducted in a tertiary care, teaching hospital in New Delhi, India, with the objectives of describing the utilization pattern of AM and G-CSF in cancer patients with FN. The efficacy and costs of AM and G-CSF prescribed were also assessed. Results: A total of 211 patients with FN were enrolled in the study. A majority of 207 (98.1%) were in the low-risk category. The average number of AM used per patient was 2.45 ± 0.02 and the AM exposure density was 1.19. All patients were administered five different combinations of AM regimens and G-CSF, irrespective of the risk category. No difference in the time to defervesence or in the recovery of ANC counts were observed with the different AM regimens. The average drug cost per febrile neutropenia episode (FNE) was Rs 4694.45 ± 296.35 (113.95 ± 7.19$). G-CSF accounted for 76.14 - 97.58% of the total costs. Conclusion: Large variations in the pattern of AM prescribed with routine use of G-CSF, irrespective of the risk status, was observed. Guidelines for the rational and cost-effective use of AM and G-CSF in patients with FN needed to be prepared. This was especially important as treatment was given free of cost to all patients admitted in the government health facility. Over the past few decades, considerable success has been achieved in the field of cancer treatment with biological response modifiers (BRM), which are agents that improve the body's ability to fight cancer by immunostimulation. Biological agents, such as interferons and interleukins, provide nonspecific active immunity, whereas the monoclonal antibodies provide passive immunity. Apart from this, other biological agents, such as antiangiogenic agents, matrix metalloprotease inhibitors, tyrosine kinase inhibitors, and tumor vaccines, are also increasingly being used in cancer treatment. 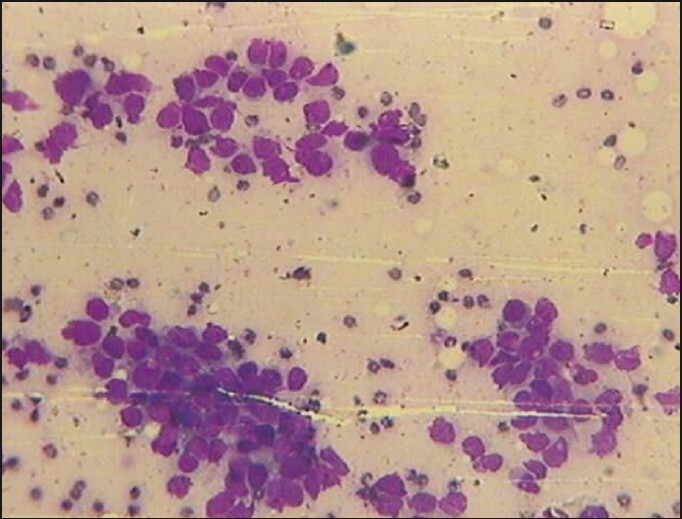 Hematopoietic factors, such as granulocyte colony-stimulating factor, are used to increase the general immunity and prevent opportunistic infection. BRM are basically used alone or as adjuvants to cancer chemotherapeutic agents. This review sheds light on the current use and the future development of cancer immunotherapy. Search strategy included Pubmed, using the terms "Biological response modifiers in cancer" citations relevant to the topic were screened. 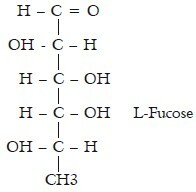 We review the present knowledge of serum fucose with special attention to its relation with various malignant diseases. We summarize the role of serum fucose as a useful diagnostic and prognostic marker when used singly or in combination. The purpose of this review is to provide an expert opinion on the practical and applied aspect of serum fucose level in clinical practice and research settings. Our review is based on information from published research studies, library books, and electronic searches through Medline and PubMed. The available published data were used as the basis for recommendations. Each of the subsections concludes to provide information to assist the clinicians and the research scientists make informed decisions. Cancer microsphere technology is the latest trend in cancer therapy. It helps the pharmacist to formulate the product with maximum therapeutic value and minimum or negligible range side effects. Cancer is a disease in which the abnormal cells are quite similar to the normal cells, with just minute genetic or functional change. 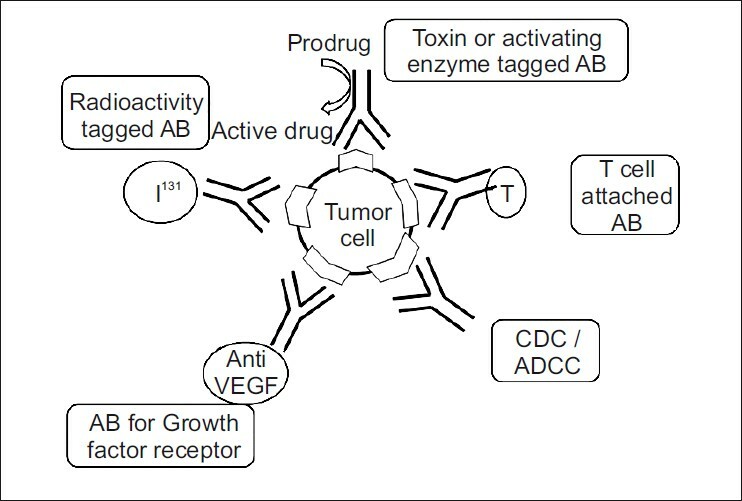 A major disadvantage of anticancer drugs is their lack of selectivity for tumor tissue alone, which causes severe side effects and results in low cure rates. Thus, it is very difficult to target abnormal cells by the conventional method of the drug delivery system. Microsphere technology is probably the only method that can be used for site-specific action, without causing significant side effects on normal cells. This review article describes various microspheres that have been prepared or formulated to exploit microsphere technology for targeted drug therapy in various cancers. We looked at the usefulness of microspheres as a tool for cancer therapy. The current review has been done using PubMed and Medline search with keywords.